We all enjoy art and know that it can come in many different shapes, sizes and forms. 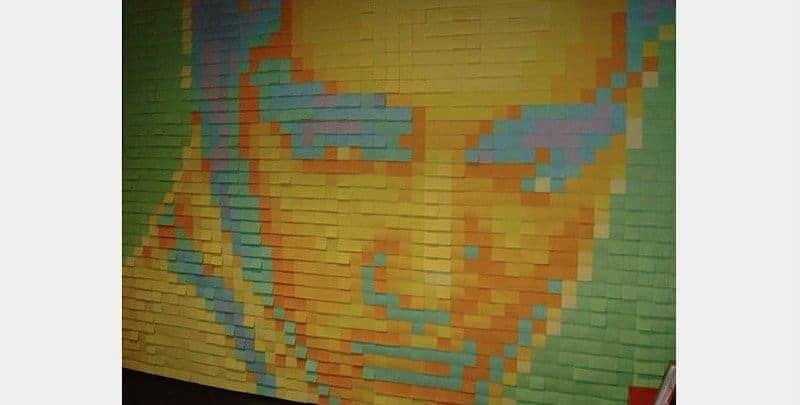 Art is something to look at and admire, but did you ever think you would be looking at works of art that are done completely using Post-It Notes? 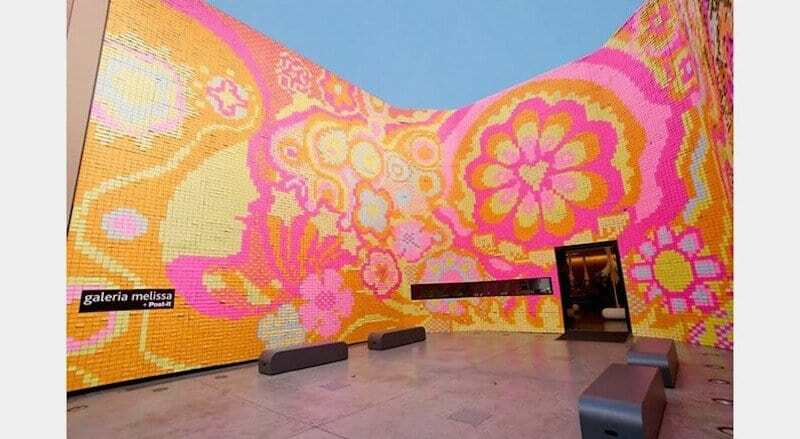 Well, today is your lucky day, as these are works of art and the artists used nothing but Post-It Notes to complete it. You’ll be amazed at how talented these people are and wonder how they did it! She is an icon and she even made her way to a wall. 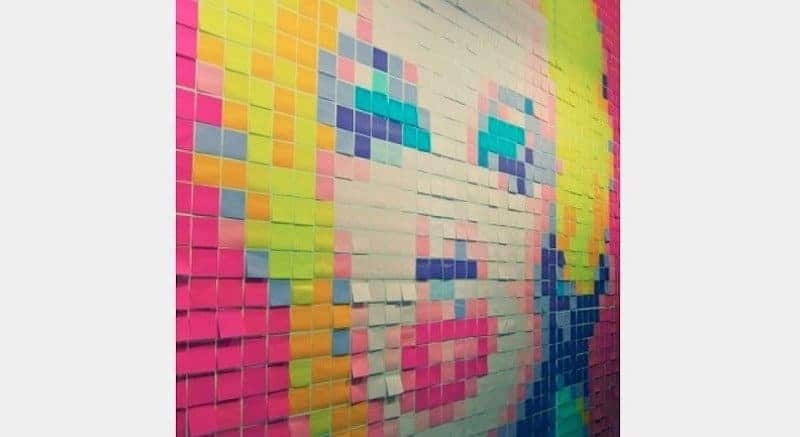 It is amazing to see how clear her face is, even using Post-It Notes! Hopefully they don’t come crashing through the windows, but they look to be sitting nicely. 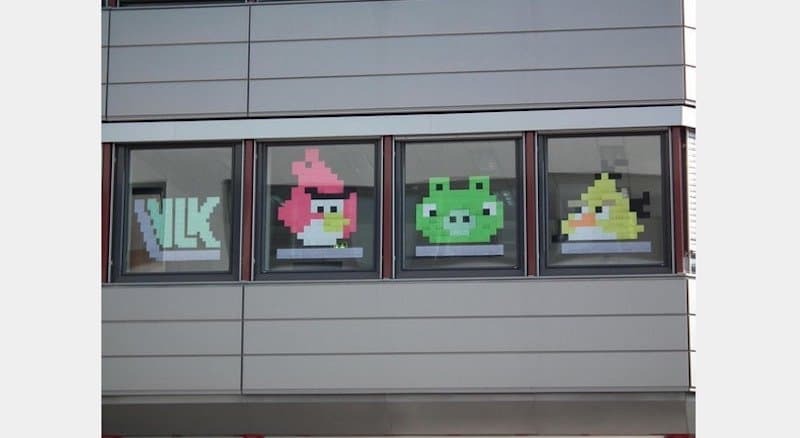 The app is still popular and this building brought out some of the game’s characters. Another icon made the wall, but this one is so cool looking. The use of the colors makes it more dark and shadowy and we love it. 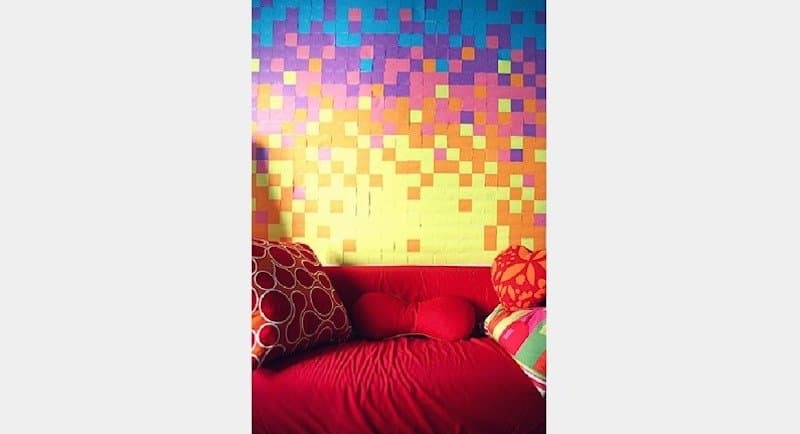 What a cool way to brighten up a room, especially a game room. 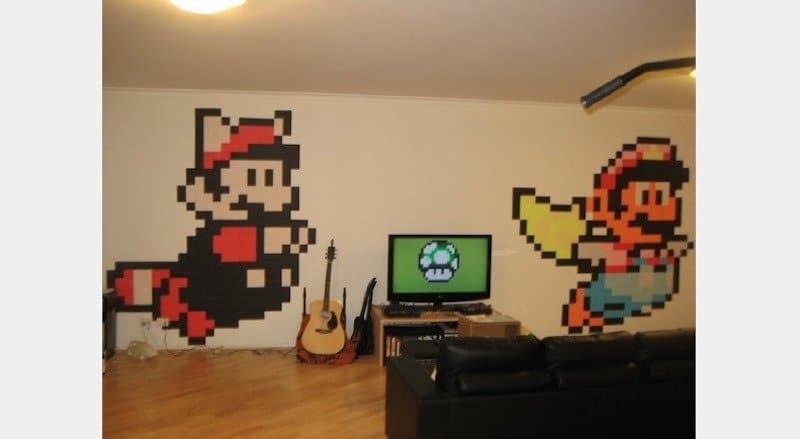 They added some Super Mario Brothers into the wall and had to include the mushroom on the screen! 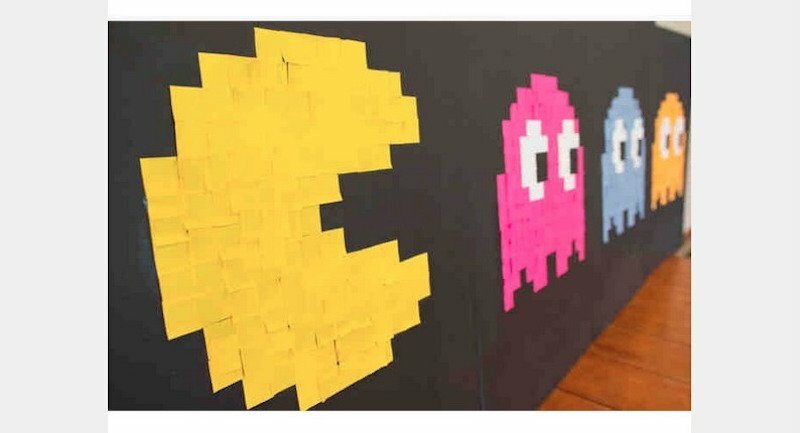 Do the ghosts disappear if Pac-Man keeps chomping his way towards them? Such a simple concept, but very well done. This office space has a lot of power, huh? 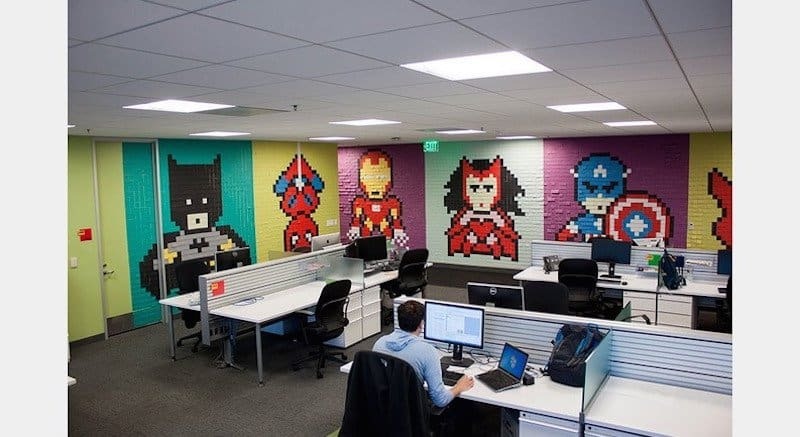 From Captain America to Batman, these people spent a lot of time and Post-Its making that wall, but how cool to look at on a daily basis! Sure, the colors are bright and not the exact color of Mickey Mouse, but this one is awesome! It is done very well and has so much creativity. 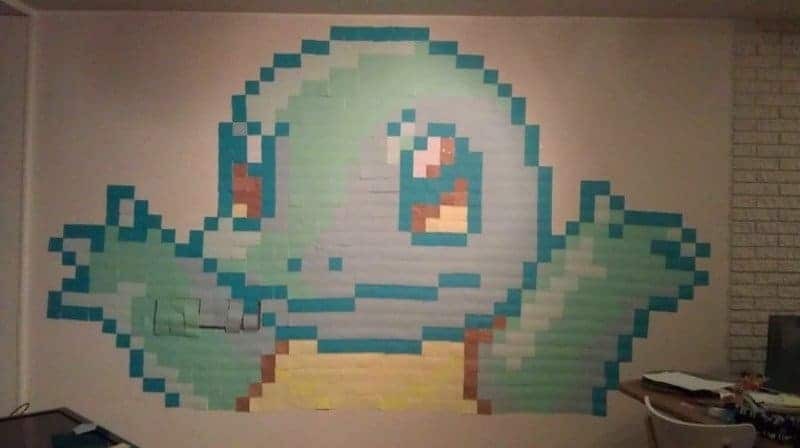 The game characters continue, as we have Squirtle from Pokemon making the list. It’s so cool how they get all the lines and designs worked out on it to make it look like the real character. Waldo does like to blend in, but we are thinking he was easily found this time around. 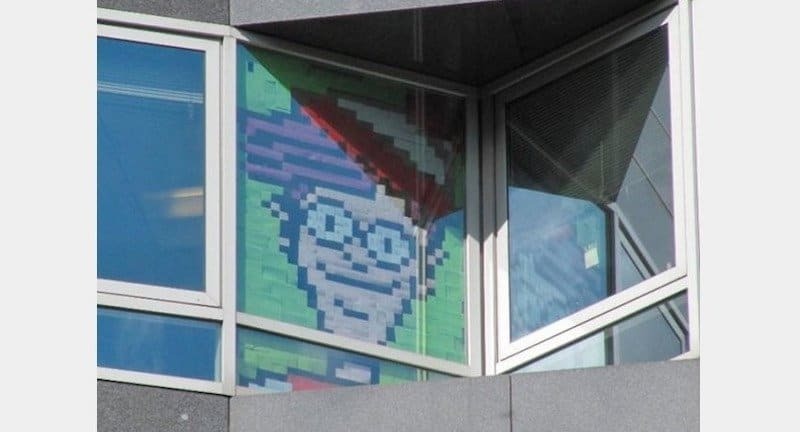 We would love to see the whole building and how cool it would be to see one window on a huge building with Waldo in it. 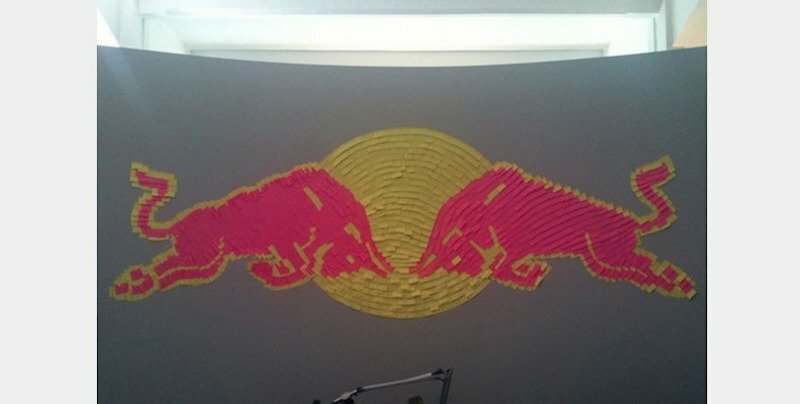 Very cool concept with recreating the logo for Red Bull, but the sun is a little off and could use some work. It would be so difficult to do circles using square pieces of paper! Even robots need love, as seen in this cute window display. The heart on the one robot is adorable and we are fans of this one, even though it is more on the simple side compared to others. 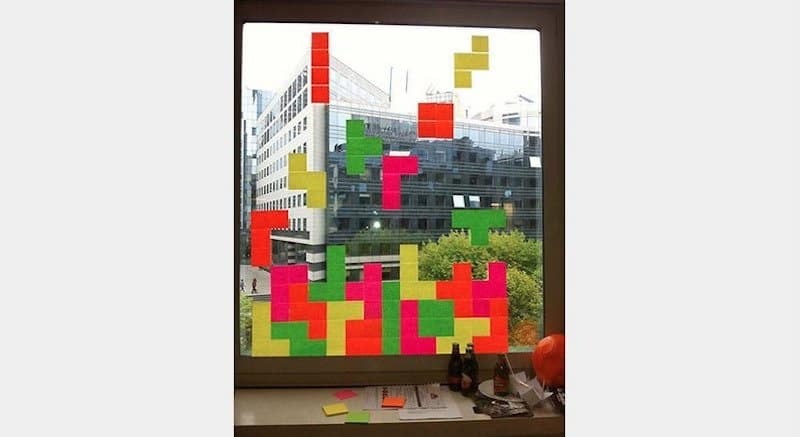 If this was our office, we would be trying to move those pieces! After looking at it a little bit more, it looks like the pieces falling down fit perfectly in the spots below them. So many colors and so many layers, but this one is awesome. It is a hand in the middle, but pixelated with all the other colors around it. 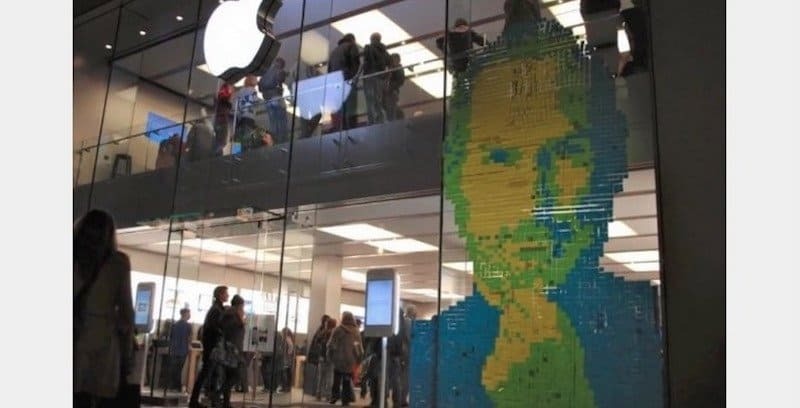 Steve Jobs was one of the most creative people of our time, so why not make a Post-It mural to honor him. Creativity is everywhere in this photo and so spot-on for Jobs. 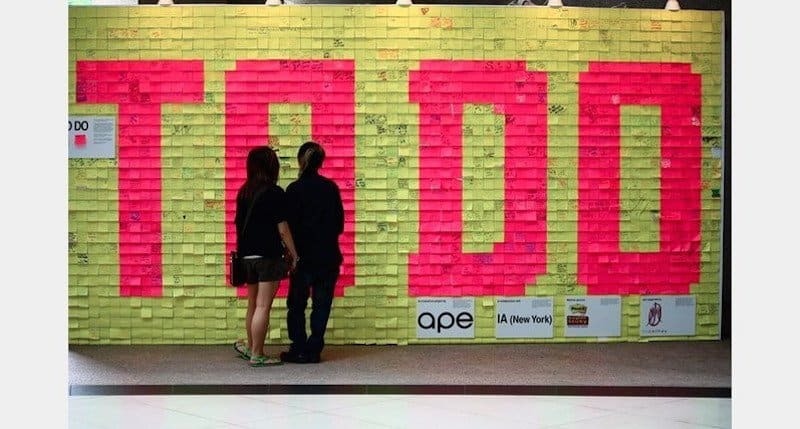 This one is simple with the words “To Do” on a wall in just two colors, but how awesome of an idea to have people write on them things they would like to do. It is an inspirational wall! As cool as this one is, it does need a few more details in there. 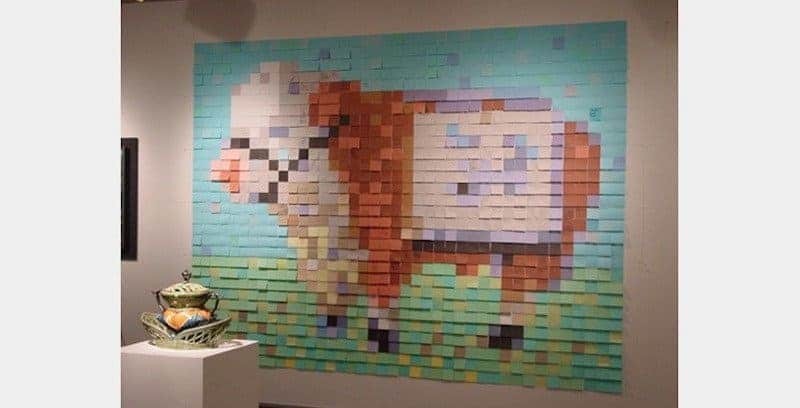 The cow seems to blend into itself at times, but the concept is there and it is cool. It is bringing the comic strip to a bigger scale. This would be a good piece to put in an office and add some color to it. 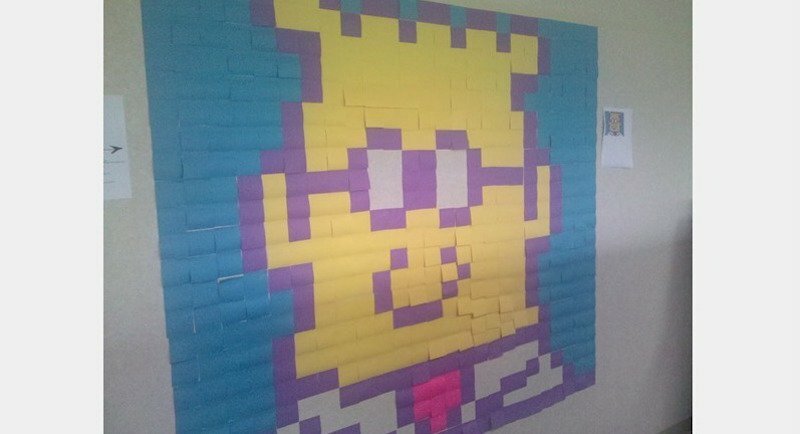 Money can be tight, so instead of spending a ton of cash on wallpaper, how about using Post-It Notes? You never would have thought of it, but how cool is that design with the couch? 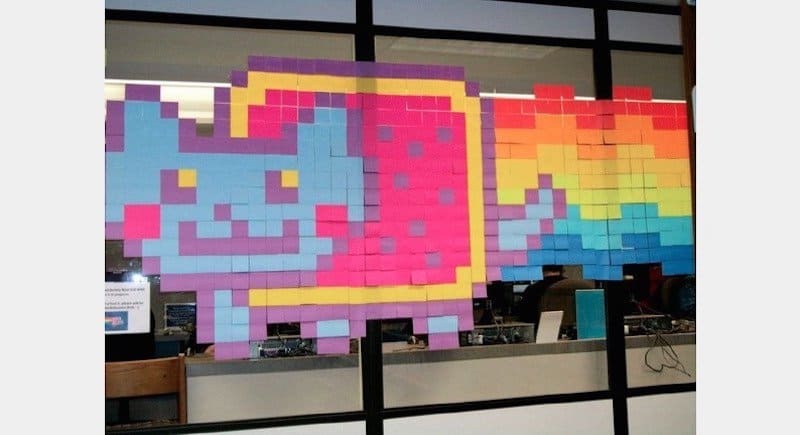 Even the Nyan Cat gets some artwork. The YouTube cat with a body of a Pop Tart became an instant hit back in 2011, but now it makes its way to the window of this building. This piece was done in 2011 to help promote Melissa Shores’ Summer collection and it was part of a stop-motion animation piece. 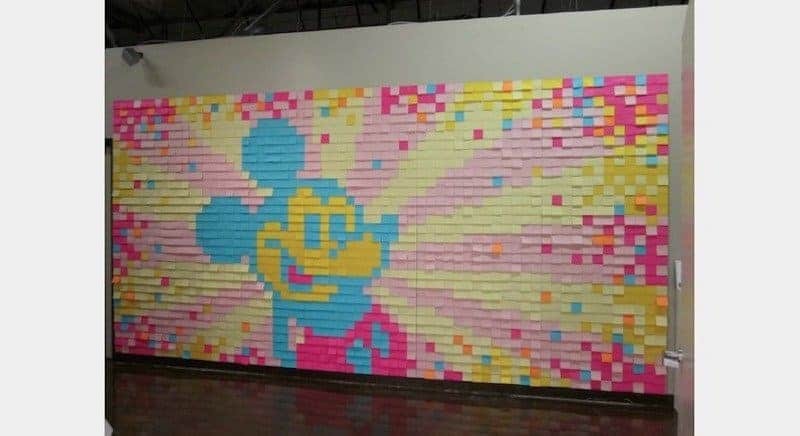 It took over 350,000 Post-Its to make!